Pure Denim Collection is strong, raw, and has character. That�s why it�s the perfect blend of fashion and workwear. Real denim is alive! The more you wash it, the more it comes to life. Wash and treat it as you want. Pure Denim takes on your identity. Be daring and combine the style that fits you. The Pure Denim collection is not suitable for industrial cleaning. These models are available in the earthy shades of green, grey, brown and mud. Everybody loves denim! 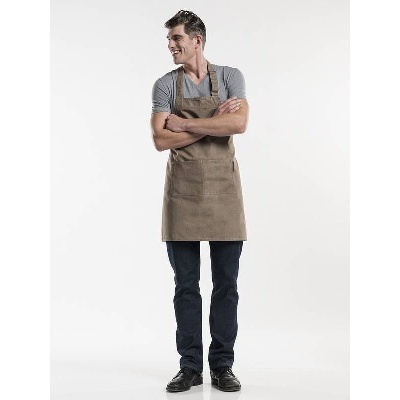 This rugged Chaud Devant Bib Apron has two front-middle pockets and is easy to adjust thanks to a metal clasp.